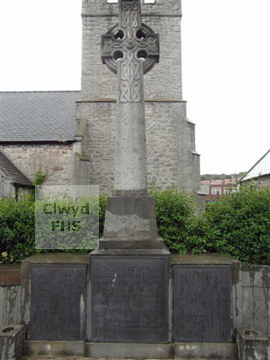 The Old Colwyn War Memorial commemorates those men of the area who died during World War I and World War II. The memorial, in the form of a stone, standing Celtic Cross, featuring Celtic knotwork. Old Colwyn is a village and community in the County Borough of Conwy. Until 1974 the area was part of historic Denbighshire, and between 1974 and 1996 of the county of Clwyd. (9th Bn.) 22 Nov 1917 25 Foster-son of Mrs E R Adams, of Glenmore, Colwyn Bay. Born Shrewsbury, Shropshire, England. Tincourt New British Cemetery, Somme, France. (2nd/6th Bn.) 15 Apr 1918 33 Son of John & M Barker, of Colwyn Bay; husband of Kathleen H Barker, of 2, Frome Hall Villas, Bath Road, Stroud, Gloucestershire, England. St. Venant-Robecq Road British Cemetery, Robecq, Pas de Calais, France. (5th Bn.) 10 Aug 1915 21 Born Much Wenlock, Shropshire, England. Son of John Bellis, of 535, John Street, North Hamilton, Ontario, Canada, & the late Hannah Bellis, formerly of Gorddinog House, Colwyn Bay. Helles Memorial, Turkey. (4th Bn.) 1 Mar 1916 34 Son of James & Eliza Broadbent, Old Colwyn. Brigade Instructor of Bombing School at Albert. Warloy-Baillon Communal Cemetery Extension, Somme, France. (14th Bn.) 8 Jul 1916 Born in Bolton, Lancashire, England. Son of Elizabeth Callow of Old Colwyn. Thiepval Memorial, Somme, France. (4th Bn.) 23 Mar 1918 23 Son of Henry & Ellen Conway, of TÅ· Mawr Cottage, Colwyn Bay. Arras Memorial, Pas de Calais, France. (6th Reserve Sqdn.) 3 Nov 1916 Born 27 Aug 1890 in Winnipeg, Canada. British. Husband of Hilda May Daniell (nee Whitley). Resident of Gwynfryn, Old Colwyn. Church Cemetery, Old Colwyn. (1/5th Bn.) 11 Apr 1918 Born Old Colwyn. Loos Memorial, Pas de Calais, France. ("C" Coy. 16th Bn.) 25 Aug 1918 18 Son of William & Margaret Davies, of "Henryd", Rose Hill, Old Colwyn. Assevillers New British Cemetery, Somme, France. (15th Battalion) 2 Aug 1917 Born Old Colwyn. Dozinghem Military Cemetery, West-Vlaanderen, Belgium. (251st Bde.) 8 Jul 1918 Niederzwehren Cemetery, Hessen, Germany. (5th Bn.) 10 Aug 1915 Born Abergele. Husband of Maria Hembry (formerly Davies), of 4, Woodbine Cottages, Keynsham, Bristol, England. Helles Memorial, Turkey. 120525 Royal Army Medical Corps 16 Jan 1918 35 Son of William & Jane Davies, of 5, Bryn Ffynnon Terrace, Old Colwyn. Non-Conformist Cemetery, Old Colwyn. Royal Welch Fusiliers 23 Oct 1918 41 Husband of Sarah Jane Edwards, 4 Glan Rafon Terrace, Llawr Pentre, Old Colwyn. (1911 Census) Amara War Cemetery, Iraq. (5th Bn.) 28 Nov 1918 32 Son of the Rev. John Edwards & Mrs Ellen Edwards, of Maes Llwyn, Old Colwyn. Born at Llanfachraeth, Anglesey. Valenciennes (St. Roch) Communal Cemetery, Nord, France. (16th Bn.) 10 Jul 1916 24 Son of Thomas & Mary Evans, of Ogwen Cottage, Old Colwyn. Dantzig Alley British Cemetery, Mametz, Somme, France. (5th Bn.) 26 Sep 1915 22 Son of Edwin & Jane Evans, of 12, Fairmount, Old Colwyn. East Mudros Military Cemetery, Greece. (5th Bn.) 30 May 1915 41 Son of James Stanley Fairclough & Fanny McBride Fairclough, of "Elderslie", Old Colwyn. Native of Aughton, Ormskirk, Lancashire, England. Boulogne Eastern Cemetery, Pas de Calais, France. (11th Bn.) 19 Oct 1918 22 Born Llaneilian. Son of Leah Foulkes, of Penmaen Cottage, Penmaenrhos, Old Colwyn, & the late Robert Foulkes. Pieta Military Cemetery, Malta. (1st Bn.) 4 May 1917 28 Son of William & Sarah Foulkes, of Carlyle House, Old Colwyn. Arras Memorial, Pas de Calais, France. Husband of Mary Catherine Jones (nee Thomas). Brother of 345406 Private William Jones 24th Bn. Royal Welsh Fusiliers listed on the Colwyn Bay Memorial. Warloy-Baillon Communal Cemetery Extension, Somme, France. (2nd Bn.) 20 Jul 1916 20 Son of Mr & Mrs Thomas Parry Jones, of 4, Garden Terrace, Old Colwyn. Thiepval Memorial, Somme, France. (59th Coy.) 6 Jan 1917 23 Son of William Lewis Jones & Elizabeth Jones, of Tyn-y-Fron, Penmaenrhos. Thiepval Memorial, Somme, France. (8th City of London Battalion - Post Office Rifles) 10 Sep 1918 Born Old Colwyn. Resident of Hammersmith, London, England. Vis-En-Artois Memorial, Pas de Calais, France. Royal Welsh Fusiliers 24 Sep 1918 North Gate War Cemetery, Baghdad, Iraq. Royal Field Artillery 9 Apr 1918 36 Husband of Emmie Jones, of 3, Arfon Terrace, Penmaenrhos. Born Llanfair Talhaearn. Sailly-Labourse Communal Cemetery Extension, Pas de Calais, France. (17th Bn.) 11 Jul 1916 Heilly Station Cemetery, Mericourt-L'abbe, Somme, France. (16th Bn.) 11 Ju 1916 28 Son of Mr & Mrs J Jones, of Colwyn. Heilly Station Cemetery, Mericourt-L'abbe, Somme, France. (11th Bn.) 25 Dec 1918 Son of Thomas Parry Jones, of Preswylfa, Old Colwyn. Mikra British Cemetery, Kalamaria, Greece. 93082 Royal Garrison Artillery (217th Siege Bty.) 30 Nov 1917 Born Old Colwyn. Vlamertinghe Military Cemetery, West-Vlaanderen, Belgium. (2nd Bn.) 3 Aug 1917 33 Son of the late David Mary Jones; husband of Ellen Jones, of "Green Bank", 3, Rose Hill, Old Colwyn. Menin Gate Memorial, Ieper, West-Vlaanderen, Belgium. H.M.S. Duke of Clarence 1 Apr 1918 30 Brother of Caroline Williams, Penlan, Penmaenrhos, Old Colwyn. (1911 Census). St. Cynfran's Churchyard, Llysfaen. ("D" Coy. 1st/5th Bn.) 10 Aug 1915 23 Son of Revd. Henry Elias and Katherine Anne Mocatta, of Clive House School, Prestatyn. Also commemorated on the Prestatyn War Memorial. Helles Memorial, Turkey. (16th Bn.) 11 Nov 1916 Born in Wilmslow, Cheshire, England. Essex Farm Cemetery, West-Vlaanderen, Belgium. (5th Bn.) 26 Mar 1917 23 Son of the late Evan Morris & of Alice Morris, of 8, Hebron Terrace, Old Colwyn. Jerusalem Memorial, Israel. (14th Bn.) 1 Sep 1916 26 Son of Robert & Mary Morris, of Tan-Y-Bont, Old Colwyn. Essex Farm Cemetery, West-Vlaanderen, Belgium. (13th Bn.) 22 May 1917 19 Son of Thomas & Frances Constance Emily Parker, of 3, Mount Pleasant, Old Colwyn. Boulogne Eastern Cemetery, Pas de Calais, France. Royal Welsh Fusiliers 21 Aug 1918 32 Born Wrexham, Denbighshire. Husband of Catherine A Parry (nee Owen). Niederzwehren Cemetery, Hessen, Germany. Royal Engineers 25 Mar 1918 42 Husband of Emma Pearce, 48 Fountain Street, Godley, Hyde, Cheshire. (1911 Census) Arras Memorial, Pas de Calais, France. (5th Bn.) 23 Aug 1915 36 Husband of Elizabeth Reckless,7, Hebron Terrace, Rose Place, Old Colwyn. Born Urmston, Manchester, England. Died at sea. Helles Memorial, Turkey. (1st Bn.) 30 Sep 1916 19 Son of Edward & Mary Roberts, of 20, Fairmount, Old Colwyn. Berks Cemetery Extension, Hainaut, Belgium. 266986 West African Frontier Force (W.A.F.F.) (Gold Coast Regiment) 24 Nov 1918 32 Son of David & Elizabeth Roberts, of 1, Rock Terrace, Penmaenrhos. Stellawood Cemetery, Durban Kwazulu-Natal, South Africa. (72nd Bn.) 29 Sep 1918 28 Son of Timothy Thomas & Mary Roberts, of 2, Glanrafon Terrace, Old Colwyn. Native of St. Asaph, Flintshire. Sancourt British Cemetry, Nord, France. Royal Army Service Corps 10 Aug 1918 21 Son of Hugh & Sarah Roberts, of 'Bro Llewelyn', Bryn Gwylan Terrace, Llysfaen. Vis-En-Artois Memorial, Pas de Calais, France. (14th Bn.) 19 Jul 1916 34 Son of John & Jane Roberts, of Elian House, Wood View, Old Colwyn; husband of Lizzie Williams, of 'Ivy Dale', Rose Place, Old Colwyn. Etaples Military Cemetery, Pas de Calais, France. (17th Bn.) 29 Aug 1917 32 Son of the late William & Emma Roberts, of Bryn Awel, Fair Mount, Old Colwyn; husband of Jennie Roberts, of 8, Bryn Terrace, Old Colwyn. Tyne Cot Memorial, West-Vlaanderen, Belgium. (14th Bn.) Died 4 November 1918 34 Born Holywell, Flintshire. Husband of Jennie Williams, 4 Bryn Ffynnon Terrace, Old Colwyn. Englefontaine British Cemetery, Nord, France. At Sea 40 Son of the late Mrs Anne Williams. Grangegorman Military Cemetery, County Dublin, Ireland. (514 Sqdn.) 2 Feb 1945 20 Son of Arthur & Jane Blackshaw, of Old Colwyn. Durnbach War Cemetery, Bayern, Germany. (1st Bn.) 15 Dec 1944 24 Son of Herbert & Patience Boulter, of Old Colwyn. Forli War Cemetery, Italy. 1139176 Royal Air Force Volunteer Reserve 24 Jun 1944 21 Son of Leopold A. Cheney, & of Margaret A. Cheney, of Old Colwyn. Seaford Cemetery, Sussex, England. 14419236 King's Own Yorkshire Light Infantry 16 Jul 1944 19 Born Caernarfonshire. Bayeux War Cemetery, Calvados, France. (2nd Bn.) 1 Mar 1945 25 Son of Thomas Foulkes Davies & Mary Davies, of Old Colwyn. Taukkyan War Cemetery, Burma. (118 Bty., 30 Lt. A.A. Regt.) 5 Oct 1942 25 Son of Morris & Ann Ellen Edwards, of Penmaenrhos. El Alamein War Cemetery, Egypt. (The Hallamshire Bn.) 30 Nov 1944 29 Son of John & Mary Ellis, of Llanrhos, Caernarfonshire. Venray War Cemetery, Limburg, Netherlands. 14708745 4th Royal Tank Regiment, R.A.C. 22 Aug 1946 20 Son of Francis George & Daisy Alice Hill, of Old Colwyn. Udine War Cemetery, Italy. (11 L. of C. Sigs.) 30 Oct 1944 27 Son of Edward Hughes, & of Dinah Hughes, of Old Colwyn. Naples War Cemetery, Italy. (1st Bn.) 9 Sep 1944 24 Son of William John Ambrose Jones & Mary Jones, of Old Colwyn. Brussels Town Cemetery, Vlaams-Brabant, Belgium. 14891982 Royal Army Ordnance Corps 24 Jul 1946 19 Son of John & Minnie Jones, of Old Colwyn. Church Cemetery, Old Colwyn. 13011026 Pioneer Corps 17 Jan 1945 45 Son of Mr & Mrs J Moore; husband of Gertrude Moore, of Old Colwyn. Thika War Cemetery, Kenya. 7516993 Royal Army Medical Corps 1 Jun 1946 25 Son of Christopher A Moreton & A Moreton; husband of Dorothy M. Moreton, of Colwyn Bay. Non-Conformist Cemetery, Old Colwyn. T/773415 Royal Army Service Corps 4 May 1942 31 Son of Robert Edward & Emily Roberts, of Colwyn Bay. Non-Conformist Cemetery, Old Colwyn. 2735658 Pioneer Corps 13 Jan 1943 41 Son of William & Elizabeth Roberts, of Old Colwyn. Non-Conformist Cemetery, Old Colwyn. (1st Bn.) 29 May 1940 22 Son of Cmdr. Arthur Cecil Roberts, O.B.E., R.N., and Amy G. Roberts, of Salcombe, Devon. (112 Sqdn.) 12 Apr 1945 21 Son of Thomas Philip & Gladys Roberts, of Old Colwyn. Malta Memorial, Malta. (230 Field Coy.) 21 Feb 1943 26 Son of John & Ellen Roberts, of Old Colwyn. Enfidaville War Cemetery, Tunisia. H.M. M.T.B. 41 14 Feb 1941 20 Son of Parker & Bertha Thorpe; grandson of Mary Adshead, of Old Colwyn. Sunk by mine in the North Sea Plymouth Naval Memorial, Devon, England. K S Kenneth Samuel Valentine?